Let Real Property Management Exclusive help you find the right home today! There is simply no substitute for a great property management company, and at Real Property Management Exclusive, we are committed to tenant satisfaction. We help clients find the perfect residence through featured property listings, brokerage rental listings, and MLS searches. Searches can be refined to include a specific price range, location, zip code, school zone, etc. We introduce new tenants to the large pool of properties managed by Real Property Management Exclusive and facilitate tenant qualification, lease-signing, rent collection, and maintenance/emergencies. For the last decade, we have built a solid reputation for ethical business practices in Nevada, and our state-licensed brokerage can also assist in finding rental homes outside of our own office listings, if none suit your needs. Our user-friendly website features our Property Organizer to better manage your searches in addition to a Las Vegas Community guide for area clarification and selection. You can even choose to receive daily e-mail updates as new properties become available! These tools, as well as Featured Properties, Brokerage Rentals, and MLS Rentals, can be accessed under the Search Rentals tab. Under our Tenants tab, prospective tenants can find our rental application, forms and contracts, frequently asked questions, and other helpful links. For our current tenants, we supply a list of Preferred Providers for maintenance/cleaning needs, a list of local utilities, and a maintenance request form. With our experience and resources, Real Property Management Exclusive is sure to be the last stop in your search for a new Las Vegas residence. 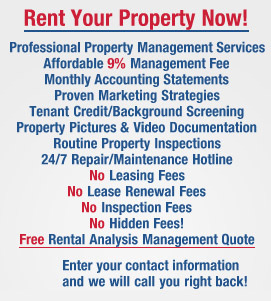 Please feel free to contact us with any questions, and we thank you for choosing Real Property Management Exclusive!